When starting my artistry career I searched high & low for the perfect case to haul my makeup when heading to a job. After researching & asking other artist their opinions, I settled upon the Zuca collection. 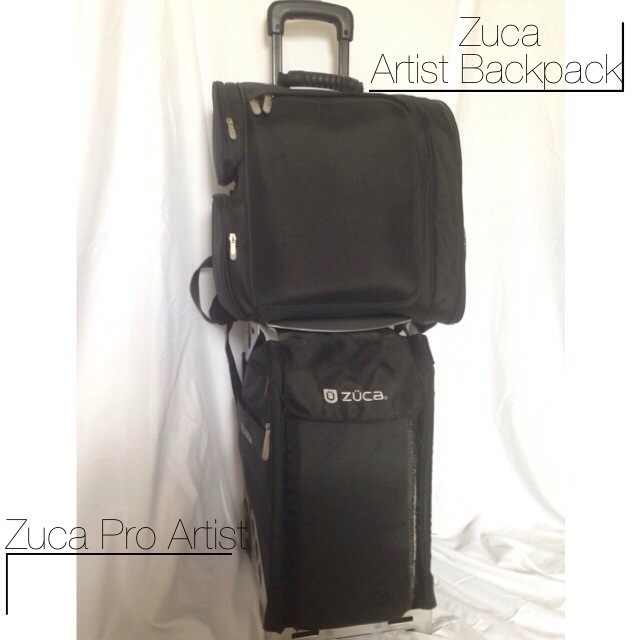 I started off with the rolling bag, Zuca Pro Artist & after out growing that rather quickly I added to the collection with my Zuca Artist Backpack. Upon first glance they both look rather small but once you look closely you will find that the bags actually can hold quite a bit. I purchased the backpack after out growing the rolling bag & because I didn’t want to haul the larger rolling bag when heading to smaller jobs. The Artist Pro rolling bag comes with 1 small utility pouch, 4 large utility pouches & 1 matching travel cover (I highly recommend using the travel cover each time you use your bag) and the back pack includes 2 small utility pouches. You can purchase more utility pouches for each bag however ONLY the small utility pouches will fit in the backpack. In my rolling bag I typically carry all of my makeup & in my backpack I keep items like my brush belt(s), towels, brush canister, hand held mirror, sanitizer, etc. For me, keeping these items separate is best for organization and makes packing & unpacking easy. I have had some wear & tear on my rolling bag but that was probably my fault due to overpacking the bag & not using my travel cover. I know that when I purchase my next bag insert I will definitely be using my travel cover. Well, I hope you liked my mini review on my Zuca set! I really am glad I made the decision to roll with the Zuca. It has served me well!